''I am a filmmaker by accident and an author by compulsion," claims Mrinal Sen, who stumbled on an unknown book, Film, by Rudolf Arnheim in the early 1940s, at the Imperial Library (now, the National Library), in Calcutta. As he went on devouring tomes, penned critiques on the aesthetics of Cinema, its philosophy, its socio-political relevance, he dreamt of a genre, called New Cinema. 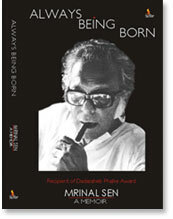 Though a disclaimer to being an academic or a researcher, with no flair for archival probe, his sheer erudition on Cinema pours in, as he reflects over these encounters with the stalwarts, the legends of the world of images, for whom Cinema became the idiom of a lexicon that depicted the voice of the times, and captured the events, happenings and mindsets of passing phases. And someone who claims to ‘live in the instant present’, this volume, his own, on himself, proves otherwise. It proves that the continuous interactions he has had and still having with the world around him have resulted in building these fascinating stories, though outrageously non-linear – emanating from the kaleidoscope of life that is complex and, indeed, delightfully controversial. He’s the Last of the Mohicans. As part of the Ray-Sen-Ghatak triumvirate, in the 1950s and ’60s, the era of radical chic – Sen’s spark of rebelliousness remains ignited. He has kept that fire of protest burning, irrespective. 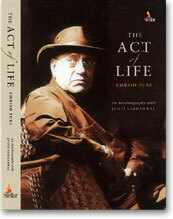 Given his acute political awareness, and Left-wing orientation – this adrenaline has lent fillip to his creativity. For, the themes that pervade his cinema mirror the entire spectrum of human suffering and experience; and in turn, crystallise the anger and restlessness of a restive mind that reacts against social injustice, economic deprivation and communal divide. Obviously, commercial disasters didn’t deter this auteur of New Wave, who created his own benchmark and persisted -- ploughing his lonely furrow – ekla chalo. Sen, the narrator, always banked on his spontaneity, while experimenting with his chosen medium. An ‘agent provocateur’, his films have triggered debates, defying the frontiers created and closely guarded by the conservatives. This buoyant social commentator has continued to confront, fight and survive on those very pressures that propelled him to look beyond and dream -- a dream that drew a very fine line between fantasy & reality -- a discerning distinction between fact & fiction…! The trademark hat, booming rich baritone, intent smouldering eyes, a towering height, and an imposing presence – only a dramatic description would possibly delineate this versatile painter of sinister strokes, who left a tremendous, hypnotic impact on Indian cinema. Amrish Puri, whose voice could send shivers down your spine, while his antics made you chuckle; his costumes could drive you nuts, and his one-liners ranging from Mogambo khush hua to Dong kabhi wrong nahin hota became household parlance. The industry’s ace villain was credited with bringing the hitherto mundane villainy into strobe light, and lent it a pride of place on the billboard with his unmatched histrionics. This son of the soil, born in the heart of Punjab in Naushahr, spent his formative years in the hilly regions and trekked miles in the Valley of Simla, the summer capital of British India. He followed his creative instincts in college rather surreptitiously, given the stern scrutiny of a conservative, authoritarian father. Moved to the tinsel town of Bombay in the early 1950s, where his elder siblings Chaman and Madan Puri were already groping in the glamour world and he had to write his own destiny. After initial heartbreaks, dejected as a hero aspirant, he turned to theatre and created an amazing repertoire essaying some of the most challenging roles under the aegis of stalwarts, like Ebrahim Alkazi, Satyadev Dubey, Vijay Tendulkar, Girish Karnad, Badal Sircar and Mohan Rakesh, among others. But pursuing this innate passion for stage didn’t provide for livelihood; bread and butter came from the rigmarole of a clerical job in a government office. And recording advertisement jingles and radio plays extended a little icing on the cake. The providential break on the silver screen came at an age when lesser mortals would be resolving mid-career crisis. And once again, he made a distinct mark in offbeat, parallel cinema of Shyam Benegal and Govind Nihalani, as he subtly transplanted the stark profundity of theatre on to celluloid. But the real litmus test was the commercial viability of his talent, as he could also rake in revenue at the box-office. Here too, he graduated with stunning performances, and became the highest paid villain breathing life into characters as the bald baddie, the cold-blooded don, the ruthless politician, the lecherous viper. The Machiavellian prince evoked the essence of evil and went on to build a treasure of excellence, whether he played a wily father or an affectionate patriarch. This star-actor became a reckoning force in both Hindi and regional films with over 300 titles in his kitty. His brilliant renditions elicited the attention of renowned Hollywood director Steven Spielberg, thus emerging on the international horizon. The book captures poignant moments in the life of a terrific performer with the class act of a chameleon, who depicted an era that encountered the most challenging facet of blending art and commerce, seeking triumph over the paradox of playing the negative and positive, to create cinematic history. Hats off!